I-TECH-supported HIV care and counseling in northern Ethiopia, in 2009. Photo courtesy of Julia Sherburne. Although HIV patients in Ethiopia have greater access to antiretroviral therapy (ART) than they did a decade ago, ensuring that patients adhere to a full course of ART is still a major challenge. In response, in 2008, the International Training and Education Center for Health (I-TECH) launched a landmark HIV/AIDS Case Management program in several of the country’s regions where HIV prevalence was high. This project was supported by the U.S. President’s Plan for AIDS Relief (PEPFAR), through the U.S. Department of Health and Human Services’ Health Resources and Services Administration (HRSA). The goals of the project are to help control the HIV epidemic in Ethiopia, minimize transmission of HIV, and help HIV patients lead healthy lives. The project actively targets and engages patients considered to be likely non-adherents by assessing clinical, nutritional, domestic, and economic indicators. Those at risk of non-adherence are transferred to I-TECH-trained case managers located within ART clinics. “ART taken for life is a challenge, but missing a few pills can cause a rapid decline in the health of a patient suffering from HIV. A discontinued course of ART will create a resistant strain of HIV that is much more difficult to treat,” says Misti McDowell, former Country Director for I-TECH Ethiopia. Poor adherence can also mean high risk of transmission in the patient’s community. The Case Management program helps mitigate that risk. I-TECH quickly realized that many patients attending adherence counseling sessions were suffering from mental health issues, including depression, anxiety, and substance abuse. It was also understood that many health workers did not have the competencies or skills to adequately engage in conversation with patients about their mental and emotional welfare. I-TECH formulated a mental-health screening tool for all ART patients to better assist patients with ART adherence and mental health issues. “Many HIV patients in Ethiopia become overwhelmed by depression, and commit suicide. The mental health component to our work has helped to prevent these outcomes, and manage mental health issues related to HIV diagnosis,” says Dr. Manuel Kassaye, I-TECH’s Care and Treatment Programs Director. In Ethiopia, there are currently only 42 working psychiatrists catering to the needs of an estimated population of 93 million. “The country is in need of a strategy to deliver mental health services to people,” says Dr. Manuel. I-TECH-trained adherence case managers, working in partnership with hospital clinicians, have directly helped to address mental health issues related to HIV in Ethiopia. The majority of case managers selected and trained by I-TECH have themselves been diagnosed with HIV, ensuring empathic relationships with their patients. A peer support group has been set up by I-TECH, in which patients have a platform to confide in others and speak openly without fear of being judged. Here, people are encouraged to share personal experiences and coping strategies. The group focuses on helping patients cope with the stigma associated with HIV, and overcome any barriers to ART adherence, including social and economic problems. 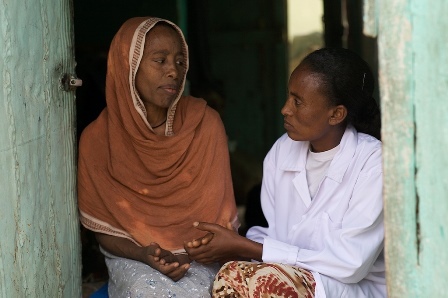 Zenabe Teklu, 35, silently sits with her I-TECH trained case manager at Gondar Hospital. Although she barely speaks, she is evidently happy to be in the reassuring company of her mentor. Zenabe had two children who both tragically died within six months of being born. After the departure of her husband in 2007, her mental health started to deteriorate. Then, after developing physical sores in 2007, she was tested for HIV, and promptly joined I-TECH’s case support program. However, between 2007 and 2013, she continued to suffer strong symptoms of mental disturbance and suicidal tendencies. In 2013, I-TECH introduced the mental health screening service at Gondar Hospital. Up to this point, Zenabe was mistakenly told that her depression and suicidal thoughts were symptoms of ART medication. Zenabe started receiving the correct medication and counseling shortly after hospital staff members had completed I-TECH training in mental health screening. Zenabe, who currently works as a cotton weaver, is happy to have turned a huge corner in her life with the support of I-TECH: “My life is stable compared to how I was before. I no longer feel full of anger and depression. I have experienced a lot of trauma, but the support I get from my case managers helps me to live a normal life”.